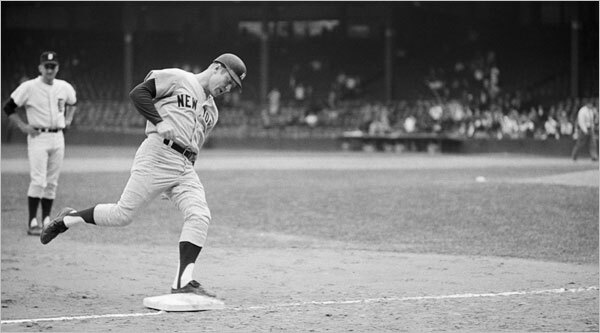 It was fifty years ago today- September 19, 1968 The Mick- Mickey Mantle nearing the end of his storied career hit career home run #535 which put him third on the all-time home run list behind only Babe Ruth and Willie Mays. Mantle was near the end and Tigers pitcher Denny McLain- who was going for victory #31 gave The Mick a gift. It was in the eighth inning and the Tigers were up 6-1. McLain called Tiger catcher Jim Price to the mound and asked Price “Hey big guy, should I let him hit one?” Price said it sounded like a great idea. He went back to the plate and asked Mantle- “Do you want us to groove you one?” Mickey looked out and saw McLain nodding so he knew this was for real. Mantle said “High and tight, mediocre cheese.” The first couple pitchers weren’t to Mickey’s liking but the third pitch came in and Mickey put it into the upper deck in right field. McLain was clapping as Mantle rounded the bases. Mantle thanked Price as he crossed the plate. The next hitter Joe Pepitone said ‘Give me one too” to which Price responded “No way, you’re not Mickey Mantle.” Mantle hit one more home run that season and would retire in the spring of 1969. Mickey Mantle is now 18th on the All-Time Home Run list. Great story. It’s cool to see that much respect from the other players. There is no way of knowing- but I’ve always thought Mantle was the most popular player ever- among the fans. With the injuries he had it is remarkable he did what he did… a healthy Mickey who took care of himself- who knows what he could have done.